World building is a tough job. An extraordinary amount of time is required to fabricate the boundaries of a cohesive, living, breathing alter-dimension. One facet of such a task is language. J.R.R. Tolkien famously crafted entire languages to support his Lord of the Rings universe; creating both a functioning alphabet, grammar set, as well as the phonics of spoken words. 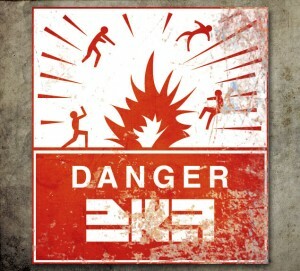 Guerrilla Games’ Killzone series is most notable for its showcase of graphical power; every iteration in the series has deservedly been lauded on its visual presentation. Like Tolkien however, Guerrilla has established their own language for the Killzone universe: that of the antagonist Helghast race (I am presuming this language, like the planet, is called Helghan). As I’ve previously discussed, selling a player on “the world” and suspending their disbelief often amounts to a multitude of smaller touches that are frequently looked over in favor for rendering engines and the relative quality of bump-mapping and ambient occlusion. One of the easiest ways to add some of these small touches is through the use of signage. It’s a thing most people take for granted, but signs are almost literally everywhere: telling us where to turn, how much something costs, where the exit is, what a business sells, the streets we follow home, etc. They are familiar and ever-present objects in our own reality and likewise in the Killzone universe they serve to flesh out the environment as well as layer a “reality” to the proceedings; that Helghan is a real place with real people who lead real lives. 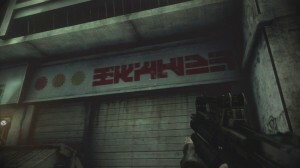 The two most recent entries in the Killzone franchise feature urban areas dotted with signs that contain unknown pieces of information each wrapped in the angular and aggressive looking Helghan alphabet. It’s important to note that the typeface deserves a large portion of the credit here. 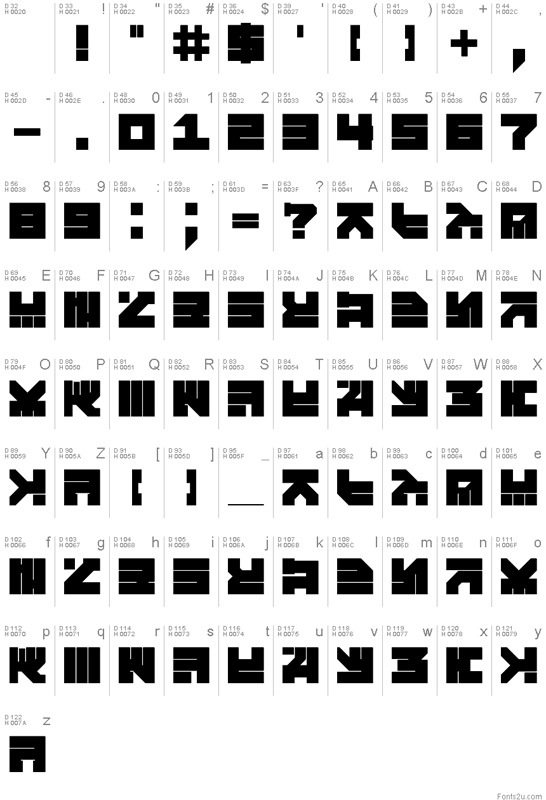 Its letters are composed of large angular geometric shapes that give each shape a glyph-like quality similar to languages like traditional Chinese or Japanese Kanji where many characters often stand for entire concepts or have multiple contextual meanings. 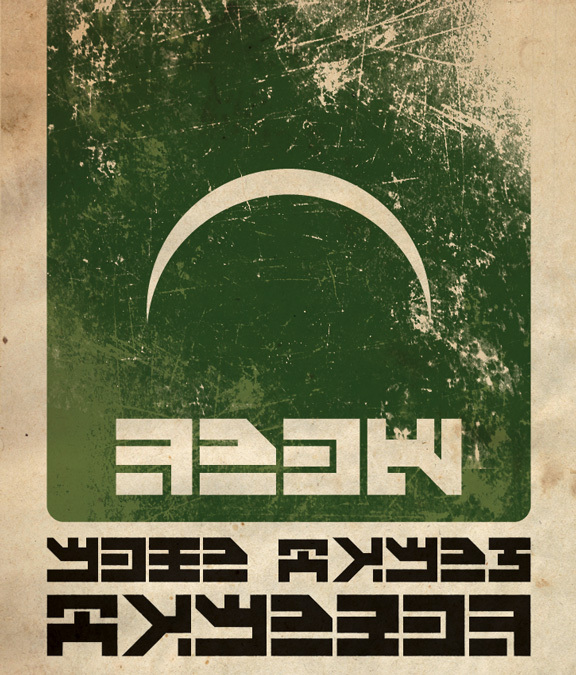 I fully intend to cover the alphabet/typeface itself a little more directly in the second part of this piece, but for now lets focus our attention on the implementation of the signs and written language of planet Helghan. 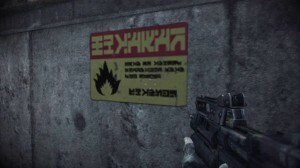 The majority of these images were taken from the chapter “Blood Meridian” in Killzone 2; much of the combat in this section of the game takes place in urban areas where this signage is most prevalent. These two stuck out to me because of the inclusion of the simple graphic elements with the font. 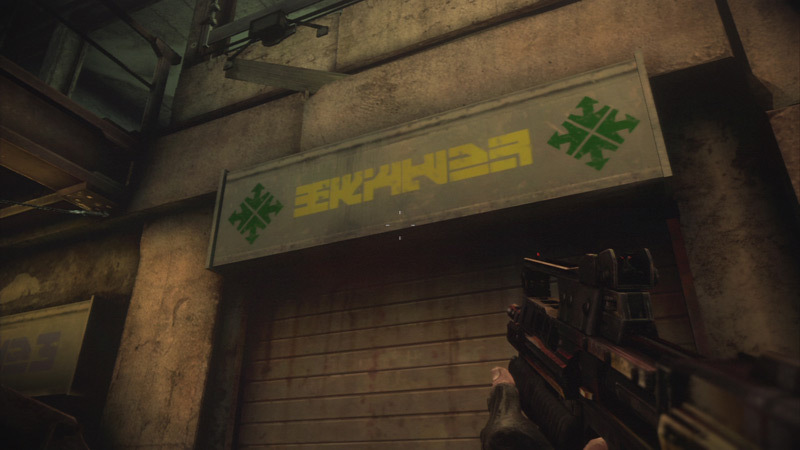 Given their placement in the game over what look like shuttered storefronts both of these seem like business signs. 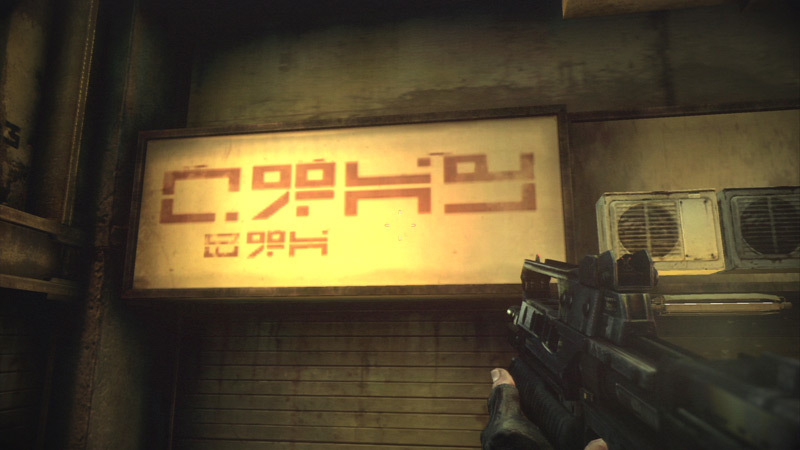 They make a few more appearances over the course of the game, sometimes in slightly altered appearances, so if anything you could extrapolate these signs represent a familiar location or chain of businesses in Pyrrhus City (the Helghan capitol). 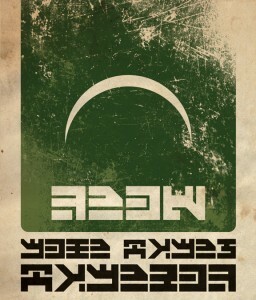 Like the above, it’s the graphical treatment of this sign that really caught my eye. 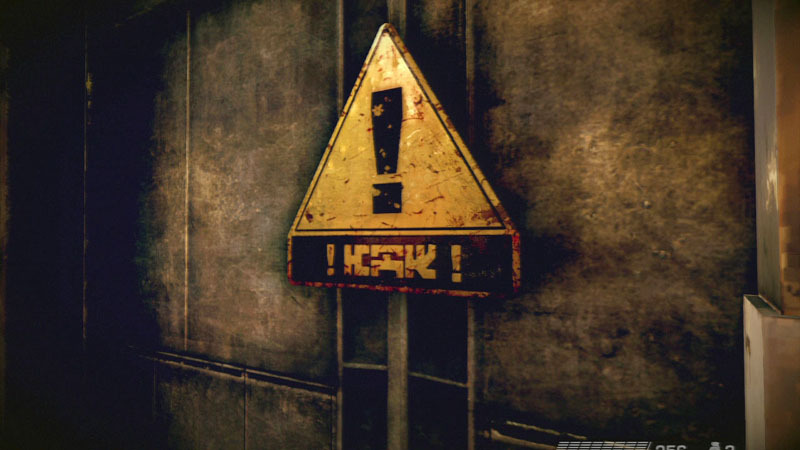 Located near the others (and near another sign discussed below) in the Dakurol Alleys area of Pyrrhus City, this banner feels more “corporate” than the others on this list. 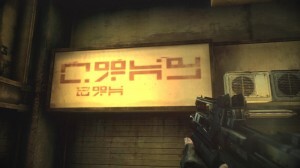 Its located higher than the other signs and its placement seems more like an advertisement than a sign for a shop or a location. Its minimal design is very reminiscent of something you might see in the background of a racing venue in earlier Wipeout titles. 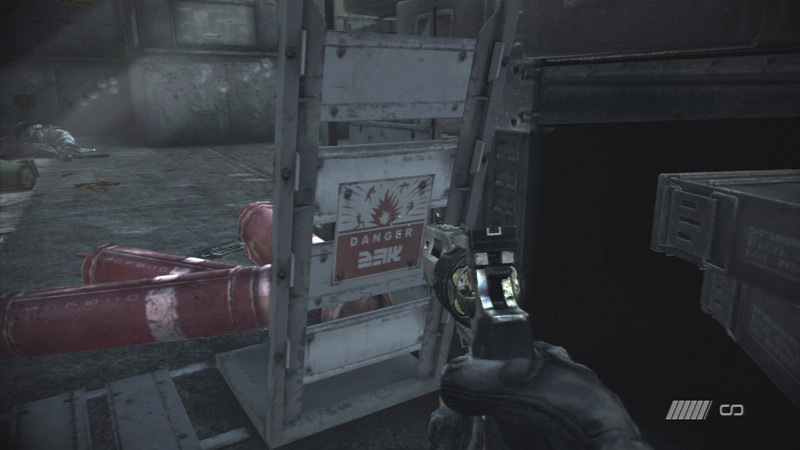 The significance of these two otherwise unremarkable signs is the depiction a completely different set of characters not seen on anywhere else in any game. 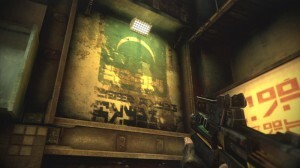 Upon first glance it may seem like they are just a thinner version of Helghan characters, but I cannot find identical symbols among the more prominently used typeface in the game. To me, this hints at a language consisting of multiple written scripts: such as Japanese, which consists of the katakana, hiragana, and kanji written scripts. In Japanese, the hiragana script is used primarily for words not included in the original set of kanji of characters. 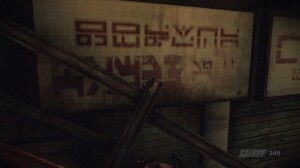 To this end, its easy to perceive these signs as being written in alternate script to cover some aspect that does not exist in the “core” Helghan language. Perhaps a store that carries imported Vektan goods or some other as-of-yet unintroduced faction. 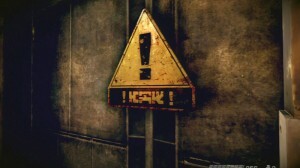 Admittedly there isn’t anything too astounding about these signs. I do find them intriguing as they represent alter-versions of signs that are more common in the world. With the angular, heavy Helghan text and bright cautionary colors to me they are quite striking to look at and “decipher” and as with all the previous examples are fantastic pieces of world-building material. 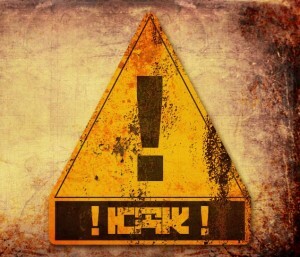 They represent on a more complex level a mental disconnect: the signs look familiar enough for you to comprehend a meaning, but something about it is very obviously different. Overall, I just think they’re sharp pieces of information design. 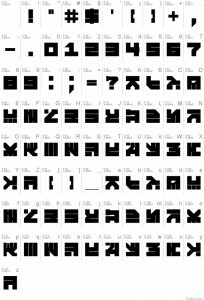 There are a handful of fan-made character sets floating around on the internet, but to be as accurate as possible I chose to recreate the font by hand. Perhaps to avoid infringing these typefaces are purposely “off”, but it felt too “cheap” to simply use them in my recreations. The possibility exists that I am in fact in the wrong here and incorrectly (however slight) re-created these characters . To truly create a working script requires a level of attention and consideration that the majority of people simply do not have to worry about or take for granted. Line weight, letter height, ascenders, descenders, em-width, cap heights, counters, and a plethora of other elements should be considered in the creation of a truly “complete” typeface. To me, the utmost important thing is consistency; characters should have commonalities between them that identify them as part of a “set” of letters, an aesthetic that is unique to the typeface. 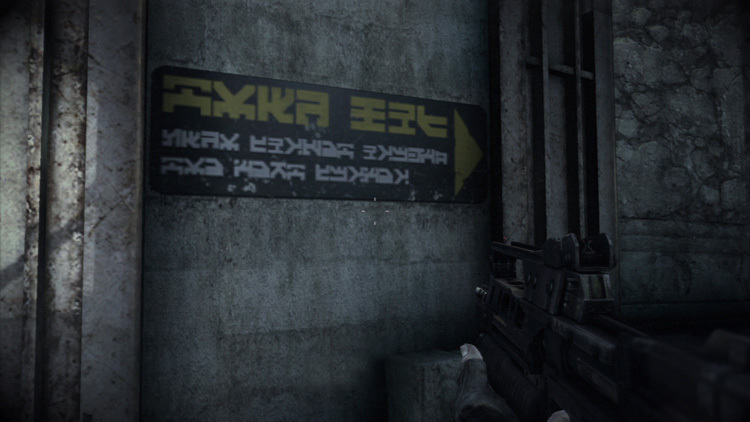 In this regard, the Helghan script(s) in the Killzone franchise contain a high-degree of consistent design. Type design is a time-consuming art form, but as we’ve established it can become an efficient and effective tool for crafting fictional worlds. 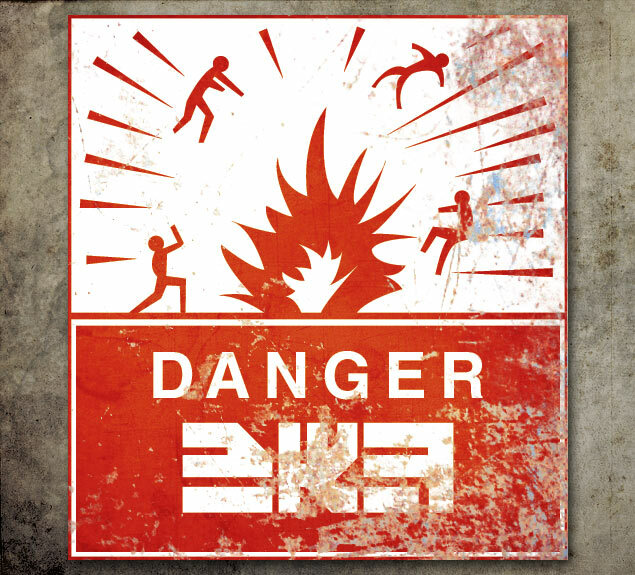 The design of the letters informs the culture they represent, the information they are used to convey adds that detail layer of “reality” to the world to suspend the player’s disbelief just enough to lend additional brevity to the proceedings. 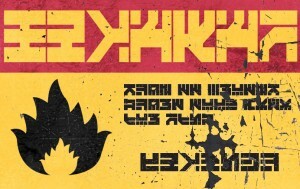 In the next installment of this piece, I will break down the more nuanced and detailed aspects of the Helghan font, but even without these analysis it stands as an accomplished work of typographic art. Killzone is a trademark or registered trademark of Sony Computer Entertainment Europe. All rights reserved. All works of art depicted and recreated have been done so in an academic pursuit to foster discussion and better understand the process of their creation. Any and all rights are held by their original creators. Visual Attack Formation does not utilize these works for commercial or financial gain. Please contact Visual Attack Formation if you are a representative of a publisher or developer and feel that your work has been infringed upon. It’s quite intersting that “helghan” does not have numbers. Plus there are coordinates: 34°81′ N – 94°33′ E/W (east: China – west: USA).